Patients ask me almost every day what kind of pillow they should be using. While it’s no secret that some pillows are better than others, I believe that finding the right pillow is rather subjective. I’ve sampled a LOT of different pillows over the past 12 years, but one kind in particular stands out above the rest: Latex. I like latex pillows because they’re neutral – they don’t have any curves that are often too big/small for your neck. They’re also affordable ($40), and the material lasts a long time (about 5-10 years). I recommend talalay latex over cheaper synthetic rubber materials. Here’s the exact pillow I use. If you’re not sure about sizing, click here. I will also say that I’ve enjoyed sleeping on water-based pillows, but feel that these are better suited for a short-term “change of pace” rather than long-term nightly use. If you like firmer pillows, this is a good option. Here’s one I’ve used. Don’t use down/feather pillows. While they are pleasant to the touch, and used in many fine hotels, they’re not supportive. You should never wake up with neck pain, soreness, or headaches. Don’t sleep with more than one pillow beneath your head. Your forehead and chin should be level with the floor when sleeping on your side. If your forehead it tilted up, your pillow is too thick. If your forehead tilts down, your pillow is too thin. 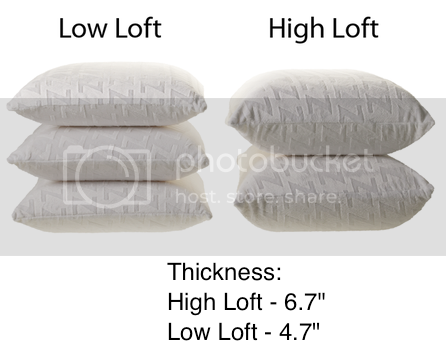 UPDATE – Here’s a follow-up article I wrote about six different types of sleeping pillows.